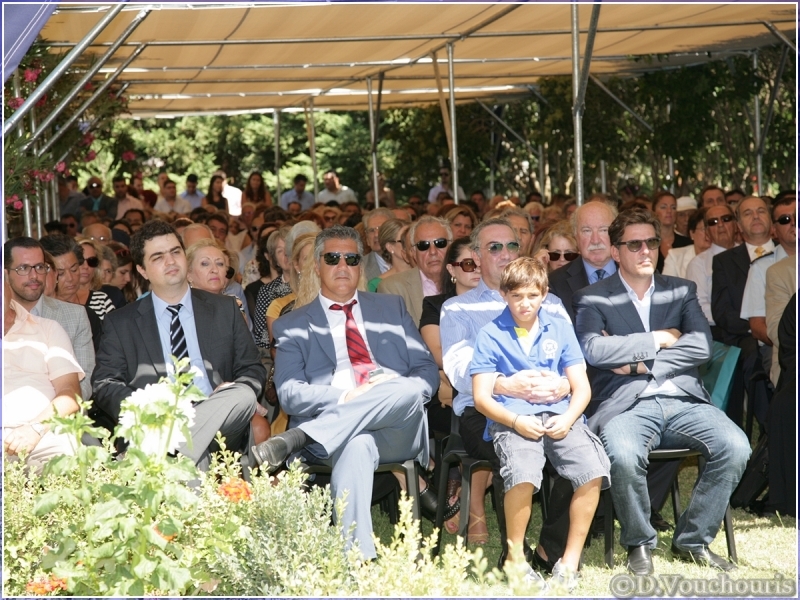 On Saturday 14th September 2013, on the Holy Cross Day celebration, the Metropolitan Bishop of Chios, Psara and Oinousses, His Holiness Markos blessed in a greatly emotional atmosphere, the Inauguration Ceremony of the Boarding School, with the presence of the Founders of the “Maria Tsakos Foundation – International Center of Maritime Research and Tradition”, Capt. Panagiotis N. Tsakos and Mr. Nikos P. Tsakos, the Chairman of the Foundation and Secretary-General Emeritus of the International Maritime Organization Mr. Efthymios E. Mitropoulos, the Minister of Mercantile Marine and the Aegean Mr. Miltiadis Varvitsiotis, the Parliamentarians of Chios Messrs. K. Mousouroulis and K. Triantafyllos, the political, military and jurist authorities of Chios, the Commandant of the Hellenic Coast Guard, European conveners of the 5th Forum of the Heads of the European Coast Guards, the students’ parents and a large number of people. 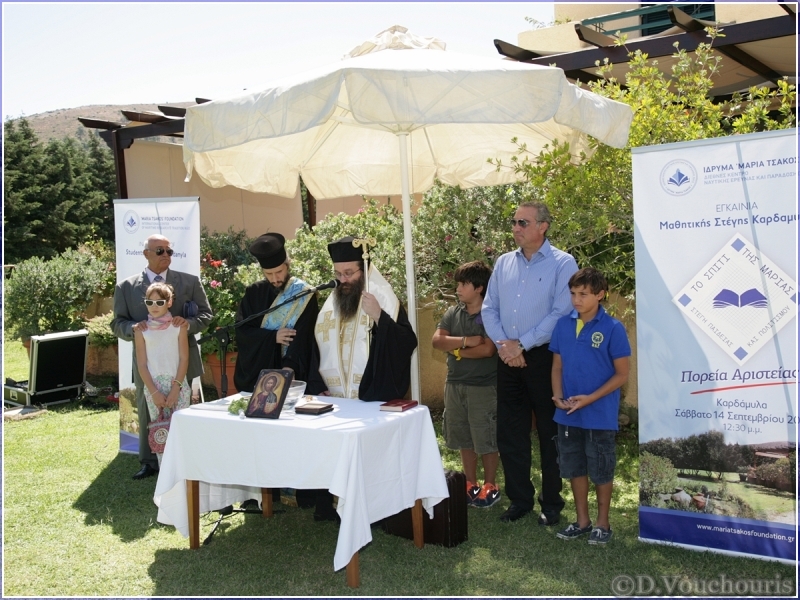 The inauguration ribbon was cut off by the Metropolitan Bishop of Chios, who was surrounded by the Minister of Mercantile Marine, the Founders and the Chairman of the Foundation. The Boarding School of Kardamyla named as “Maria’s Home – Education and Culture Campus” which was established by the “Maria Tsakos” Foundation at the premises of the memorable Maria Tsakos’ house in Kardamyla of Chios, is located at a superb area of six acres in the area of “Lousiani” in the traditional maritime village of Chios. The creation of the Boarding School reflects the vision of Capt. Tsakos’ family dedicating Maria’s estate in the village towards children’s happiness and further development. On an initial stage, “Maria’s Home” will host nineteen children, both from Chios and other parts of Greece, which, although have great abilities and an eagerness to knowledge, their families faced difficulties in further supporting their study extension. In the forthcoming school year, it is planned for the number of students to be increased to 22-25. The Boarding School’s function secures the future of the Secondary Education in Kardamyla, which was endangered with a potential cease of operation and unification with other schools due to shortage of students. In their speeches, the Foundation’s General Director, Admiral HCG (rtd.) Stavros Michailidis stressed out that the Founders’ vision is to offer the students a chance to “strive for excellence”, which will fortify them in becoming valuable and contributing members of society. After the Blessing and the cut of the inauguration ribbon, the participants had the chance to make a tour at the premises of the Boarding School, including the spacious students’ rooms, the I.T. Center and the recreational facilities. Everyone welcomed the Boarding School with warm words of enthusiasm. The establishment and the function of the Boarding School were saluted, among others, by a letter of the Minister of Education, Mr. Konstantinos Arvanitopoulos. The parents and the students were especially enthusiastic. Although the children have been living for only a short period of time in their new house, their hearts are filled with the loving care of the School’s personnel and emotions of security regarding their future, since they now have all the necessary tools to achieve it. The Foundation requires that they try hard and study in order to accomplish their objectives.